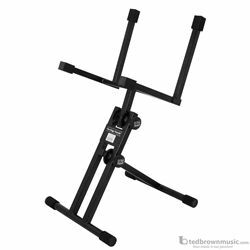 The strength and versatility of this stand comes from the double clutch disk that allows you to remove and rotate the support arm assembly. The solid steel double stamped 3" disk allows for a secure locking position every time! The A-Frame base with 1" square tubing construction will adjust its floor spread in order for you to get the most support under your amp. Ridged end caps keep all metal surfaces off the ground and act as a shock absorber.